The green building movement in this country has given rise to several rating systems either for manufactured products or for entire building projects that seek to establish specific levels of achievement in the creation and performance of green buildings. The best known of these green building rating systems has been developed by the U.S. Green Building Council and known as the LEED® rating system. This is actually a family of ratings that apply to different building situations (e.g. new or existing buildings, core and shell, interiors) and in some cases, building types. The LEED for Schools rating system was developed to specifically address the green design and construction of K-12 schools. Based on LEED for New Construction, it focuses on classroom acoustics, master planning, mold prevention, environmental site assessment, and other issues important to these educational buildings. 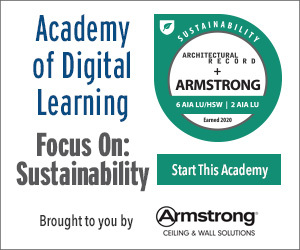 As such, LEED for Schools provides a comprehensive tool for those who wish to build green using measurable results by recognizing the uniqueness of school spaces and their occupants. All of the LEED rating systems have been subject to ongoing changes and updates since their inception, but the basic categories of defining green buildings have remained the same across the different versions over time. The contributions that HDPE lockers can make to green school building design fall into several categories. Among the most common sustainability features of plastic products used in buildings, recycled content is near the top of the list. HDPE lockers can be specified and manufactured from between 25 percent to 100 percent of pre-consumer recycled content. Further, the beauty of the material is that its strength is retained throughout its useful life so it is fully 100 percent recyclable when its service life is finished. Beyond recycling, HDPE lockers are also able to contribute to the minimization of construction waste. As noted earlier, they are commonly shipped in corrugated cardboard covering which is fully recyclable and minimizes the amount of packing material used. Further, since they are available from manufacturers located in the U.S., regional material contributions are possible. The LEED for Schools program has a particularly strong focus on this category. It is the first rating system to address acoustical control for example and uses an industry standard developed by the American National Standards Institute (ANSI) to identify specific background noise levels between classrooms and corridors and between other common school spaces. This is relevant to our discussion here, because HDPE locker doors have been tested and shown to be up to 6.4 decibels quieter than steel lockers doors when being operated. Since a 3-decibel increase equates to a noise that is twice as loud, this testing shows that metal lockers are actually three times louder than HDPE lockers. This is a significant difference that can help to dramatically improve the acoustic environment and noise levels within schools. The other important indoor environmental quality focus in LEED for Schools is the quality of the air being breathed. Since HDPE lockers use no paints, coatings, adhesives, or sealants, any potentially harmful effects from those are eliminated. That includes elimination of volatile organic compounds (VOCs) and urea formaldehyde, two of the most common indoor air pollutants. Further, HDPE resists mold, mildew, and fungus, meaning these potential threats to indoor air quality are reduced, if not eliminated outright. 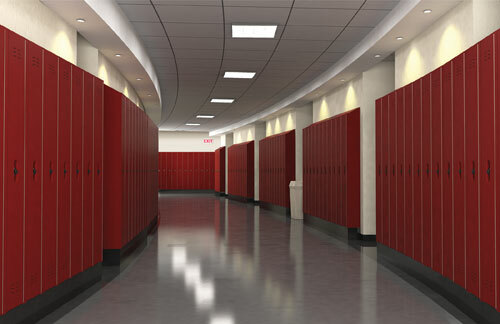 HDPE lockers can contribute to green school design particularly since some carry the GREENGUARD Children & Schools Certification for indoor air quality.